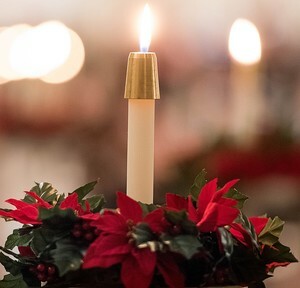 St. Stephen’s Church will hold its annual Carols by Candlelight concert on Saturday, Dec. 15, at 7:30. in the church at 351 Main St. in Ridgefield. The event is a celebration of Advent and Christmas presented by the St. Stephen’s Festival Choir, St. Stephen’s Choristers, soloists, and the Connecticut Chamber Players, a 28-piece professional orchestra. Scott Toperzer, St. Stephen’s Minister of Music, will conduct, and Arno Steinig will play the organ. Carols by Candlelight will include selections from J.S. Bach’s “Christmas Oratorio” and Handel’s “Messiah,” works by Gustave Holst, Felix Mendelssohn, and traditional carols. Featured soloist is Matt Sullivan, baritone, who has soloed with the Yale Schola Cantorum and the Bach Collegium Japan. Doors open at 7, and the suggested donation is $20.